First, cook the potatoes. Bring a pot of water to the boil and add the potatoes. Cook for about 10 minutes or until the potatoes are tender and cooked through. Drain and set aside. 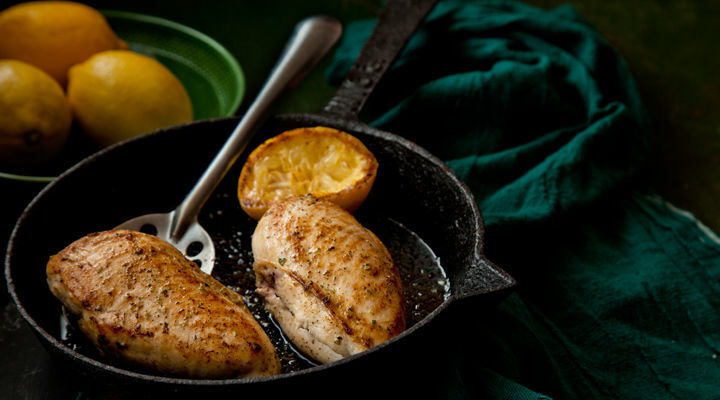 Place the chicken in a bowl or baking dish and pour over half the lemon juice, then season with salt. Heat the oil in a small frying pan set over a medium-low heat, then add the chicken. As you sauté the chicken, add the remaining lemon juice along with a pinch of oregano and some freshly ground black pepper. Cook for 5 to 10 minutes on each side, until the chicken is completely cooked through. Garnish with parsley and serve with the potatoes.